It’s the time of year where I get all wild and crazy and need to ride as much as possible. I also start to panic that my ponies are not in tip-top condition and competition season is sneaking up. Add the mud and bad footing in my riding areas at home and how easily I get bored riding at home, and BOOM. You have me jetting out of work, and rushing off to the trails to get in a conditioning hack on a work night. Of course when you are in a hurry, and particularly when you are in a hurry with horses, things happen. Here is what happened on Thursday night when I rushed home from work, hooked up the trailer, grabbed Poe out of the field and tossed tack on him in an attempted to kick-start his conditioning on a local trail. Tacked up, helmet and cell loaded in my truck, dogs on the loose, I was ready to go. Leading Poe by the halter and lead fitted under is bridle, I approached the trailer, pulled the pin, swung the door open, and climbed inside. Poe was just behind me and about to step up when…. Ash, my husband’s Cattle Dog, “heeled” Poe, ie; bit him on the heels. Poe swung around and hit the door pretty hard. The door swung the rest of the way open, rebounded even harder, and swung back – slamming closed, and the pin shot closed. I was stuck in the trailer and Poe was stuck outside. The lead rope severed where the door closed, leaving me with a half-foot of lead and Poe with the rest. 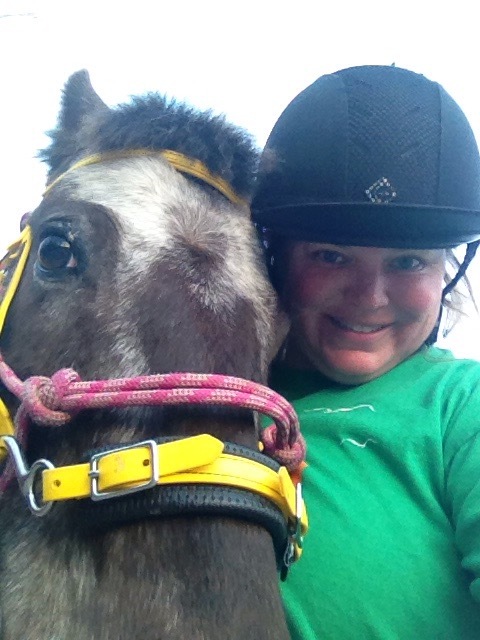 Ok, loose pony, rider stuck in the trailer with no phone (did you catch that? My phone was handily loaded in the truck). Having accidentally been locked in the trailer one time before (that time it was a strong gust of wind when I was leisurely cleaning the trailer out while chatting on the phone and I was able to call my husband to save me) I knew I could not reach the pin to let myself out. AWESOME right? When the door swung back, Poe pulled back to avoid it, and skittered into an old small pickup that is parked behind my trailer (it belongs to the landlord and looks like its been there a few years and is not going anywhere) and his rein, which was flapping loosely, caught on the little tiny window handle on the back of the truck’s cap. Poe, being the mighty pony he is, pulled back and ripped the cap off of the truck and drug it several feet away. I looked out the gap in the trailer and Poe was just standing there, attached to the cap, dogs circling, and he gave me one of his classic “grumpy pony faces”. I started yelling like crazy, and was incredibly lucky. My husband had just gotten home and was on the porch (which is a little ways away and out of sight) and heard me yelling. He came running (actually running) and released me from the trailer. I released Poe from the cap, who was also unharmed and then I helped Rich put the cap back onto the truck. Poe hopped right in he trailer, I closer the door and we head out for a ride. There were so many things I was sloppy about, and admittedly, usually am sloppy about, and probably will continue to be sloppy about. This situation was sort of a freak thing. What are the chances that the rein, which should not have been hanging loose like that in the first place, would have caught on that tiny little knob? Very slim. And then what are the chances of the door flying closed at just that exact moment with me inside and unable to stop it while Poe was outside? Again slim. And even more, what are the chances of my husband being home, and even more, in ear shot!? HUGLY slim! I would like to say I learned a valuable lesson and will be sure to correct all of my errors in the future. But being completely honest, Ill probably be more likely to keep my phone on me and keep a closer eye on the dog but really not change much else. I can say it was a lovely ride. Poe and I did 5.6 miles in just under an hour and a half. We were mostly walking since Poe is shoe-less. 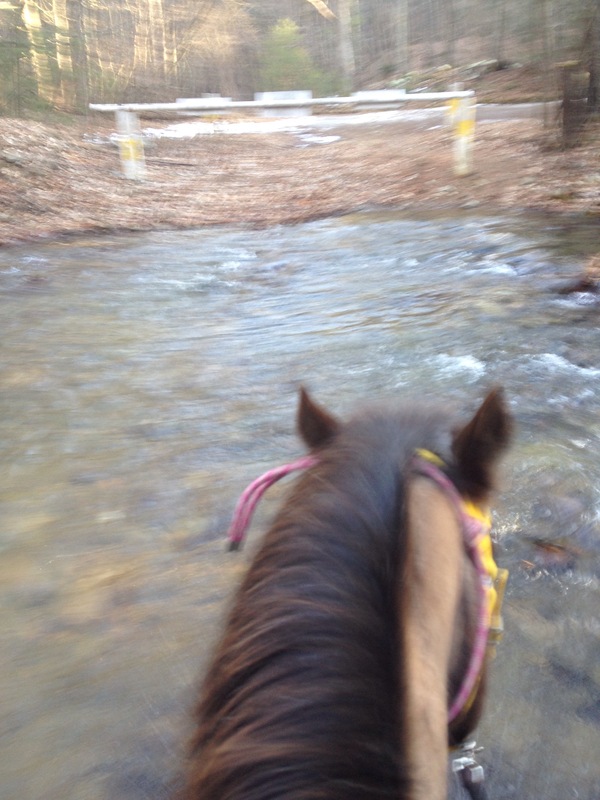 Although he really enjoyed the ride (which was not his attitude about trail riding last year). He marched across all the creek crossings without encouragement or a break in stride, and didn’t try pulling a single pony stunt. I also ran into Laura and Gail out on the trails, which was nice and I was back home and done feeding before dark. Lovely.